A search on “optical datacenter” using Google yields a 4.29M results. The links above are just from the first page or well known papers. 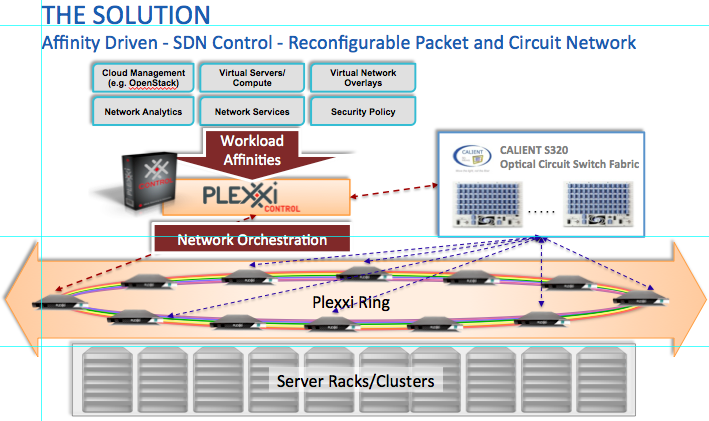 What is Plexxi and Calient showing? Here is a bit of the inside story. The demonstration in the Calient booth at OFC was assembled in the past few weeks. We did not even agree to put it together until late February. One of my technical team members, Colin Ross did some of the heavy lifting, but it was a team effort. The actual connector in Plexxi control that communicates with the Calient switch was done very quickly (a couple of hours) in Python. 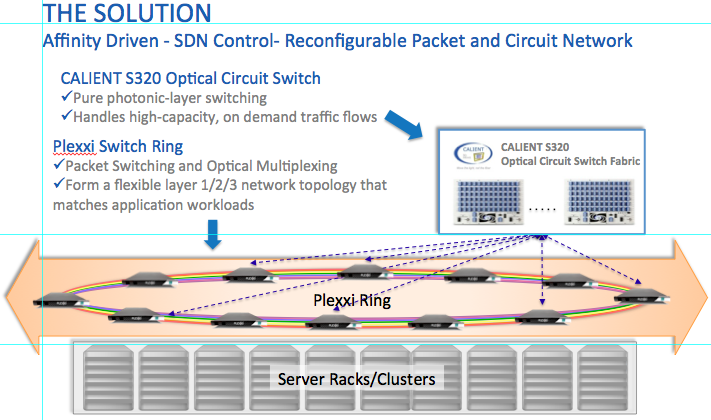 What we did next was to use telemetry data from Boundary on VM performance to signal to Plexxi Control to change the topology of the network using the MEMs fabric in the Calient switch. This is a sharp visualization of end-to-end automation from the application level down to the network, rather than the wires up. First you will see that we have a connection between switch P_05 and P_04. This correlates with the Boundary window showing “Client4->Client5” with activity. When activity moves to “Client5->Client3” (around 18 seconds) on the Boundary window, you will see shortly after that the Calient connects P_05 to P_03. If you are a networking person, this should be a pretty cool demo. What we are showing is the true power of SDN to use applications to express a need to the network and for the network to programmed for that need all through a Python interface. I think that is pretty awesome, but I am sure there a people that want dad’s CLI back. ← How Does Change Occur?